The article proposes a method for the coefficients reconstruction of a discrete autocorrelation function of random signals with a unimodal power spectral density to construct their parametric models. The method is based on finding the optimal values of the relative width ΔFT and the weighting factor α ∈ [0; 1] of the spectral mode, which characterizes the share of the Gaussian and resonant components in the spectrum envelope. The proposed method makes it possible to reduce by 1.5–4 times the discrepancy between the control and estimated spectra in comparison with the known approaches to parametric spectral analysis. An increase in the adequacy of spectral estimation makes it possible to reduce the length Mof the analyzed time sample by a factor of 2.3–4 times, while maintaining the accuracy of the spectral analysis achieved by other known parametric methods. Winnings are achieved by using a priori information about the spectral properties of the analyzed process. Russian Text © V.G. Andrejev, N.L. Tran, T.P. 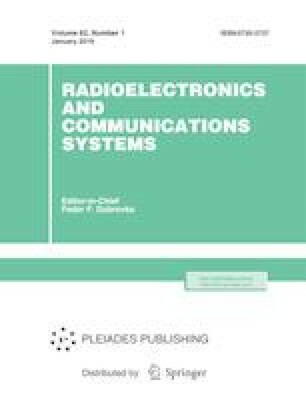 Nguyen, 2019, published in Izvestiya Vysshikh Uchebnykh Zavedenii, Radioelektronika, 2019, Vol. 62, No. 1, pp. 45–53.